Having wrists tendonitis I can't be on the computer long; so the best thing for me to do is being outdoors and looking for bugs. I wonder if shooting pictures have anything to do with my wrists pain! I was minding my own business checking email, returning comments, and thinking about what I want to post when suddenly I heard terrible knockings. I recognized the noises that woodpecker does, but the sound today was very sharp since it was metal that I heard. Sure enough, it was this gorgeous woodpecker, pecking at the corner of my roof and hit the metal part of it. He/she was at it for quite a while, and insisted on that particular area. 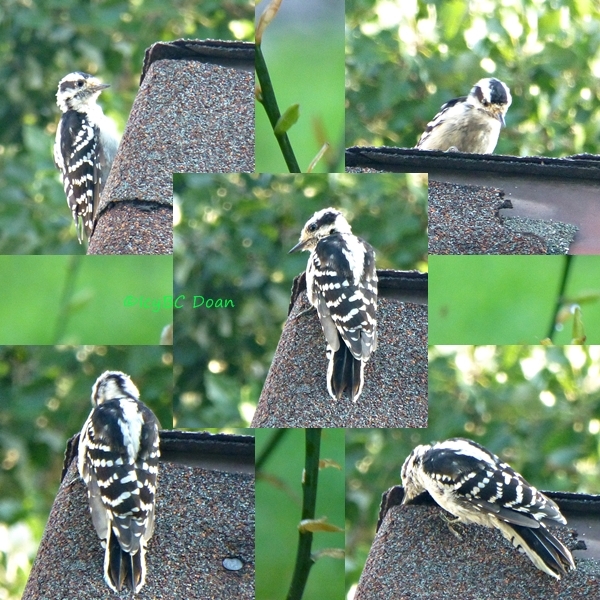 Today was a busy day for woodpeckers as I saw at least three others around my home. As I was about to go inside, this very unusual skipper came resting right on my path. It had such a dark brown color that it took me a while to realize it was a skipper. I am used to see fiery skippers in my part of the world, not this one! We had plenty of noisy bluejays around the neighborhood, and I don't mind their loud calls as much as I mind motorcycle revving. I am always amazed to see wild life in the thick of the city! There is something magical about nature sharing in with human busy world. I grow this pink cosmos from collecting seed heads last year! I have to say that they did wonderfully in pots along the side of my house. A little whimsy, but blooming beautifully! Shasta daisy is growing in my garden for the first time, from the seed box I bought a year ago. I have just one plant, but many blooms! 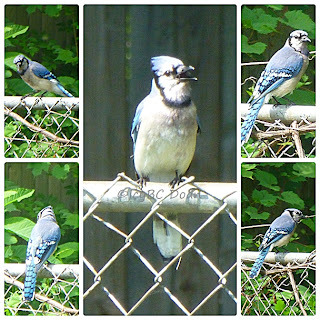 It was raining, quite heavily, but hunger brought this bluejay to the feeder! It was fun for me to watch him behind the glass window.